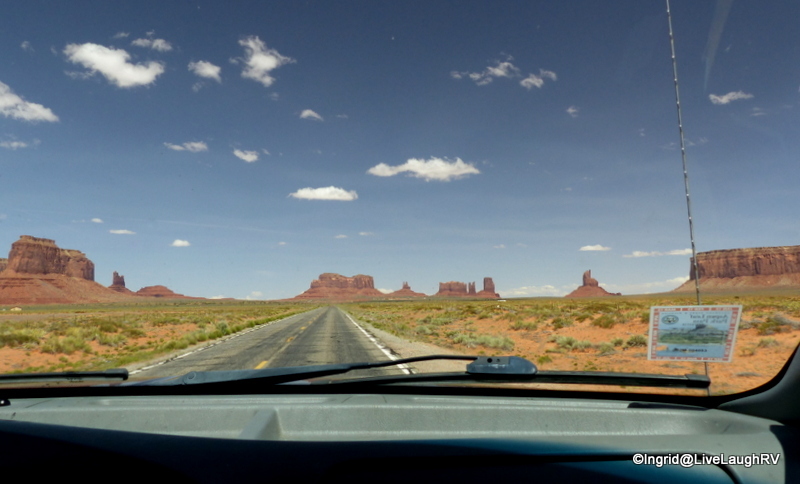 I am behind on my reading and I agree, I’d never tire of driving through Monument Valley. I’ve only driven in that part of the world twice once in ’89 going west and again the following year – headed east and I’ve been here ever since. Pork (and chicken) is always a good choice for breakfast and ribs for dinner – yum. Have a great week. Sorry to hear about your generator but isn’t it great to have such great friends to help out in such situations? Glad to see you had a wonderful Mothers’ Day Ingrid. Wow, that is some scenery. I’ve never been “out west” so it’s all new to me. Sounds like you lucked out, but paid them back splendidly with the spankatini! I’m originally from Illinois and when I first traveled through Utah, I was awed beyond words. Beautiful state. Unfortunately, our time in Utah this season was very short. We have some new locations planned out for the summer that I hope the weather will be cooperative for us to explore. Hope the rains haven’t been too bad for you. Utah is so gorgeous. 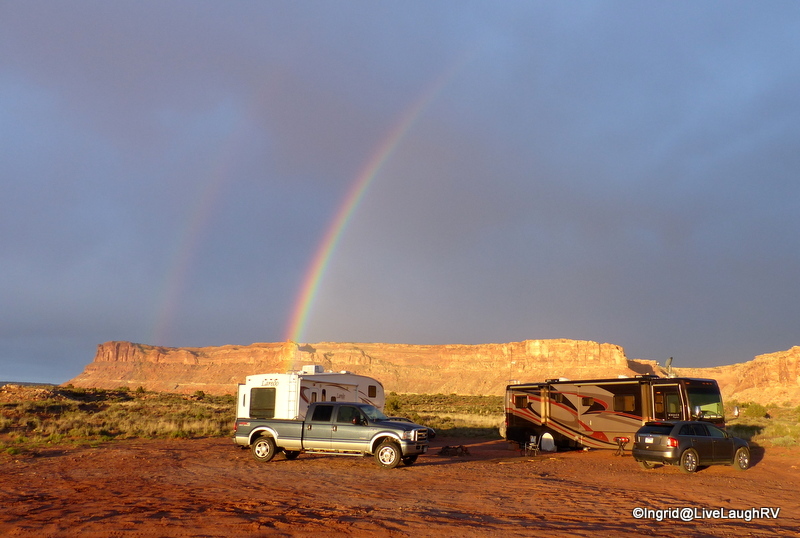 I love the photo of your RV with the rainbow. Any thoughts of submitting some of your shots to Escapees for the magazine cover? I think they prefer the vertical format, but you may be able to do some creative cropping to make it work. Agree – Utah is gorgeous. Thanks Cheryl for thinking my photos are good enough for a magazine. What fun with good friends. 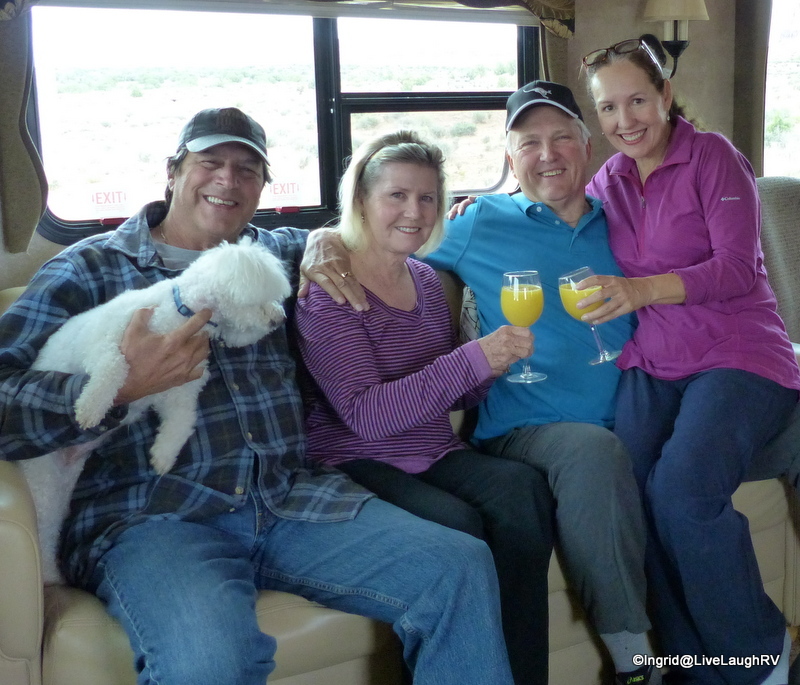 Sharing mimosas, power, laughs and delicious food. I want to run into you on the road. 😉 Ingrid I also loved the photo through your windshield. It left me feeling as though I was traveling with you. What a fun Mother’s Day:) Breakfast sounds so good!! For some reason the NP has decided to have only one entrance line. This has been going on for quite awhile someone who lives here said. We were told the park closed mid-afternoon on Sat. and Sun. this past week-end because it was full! 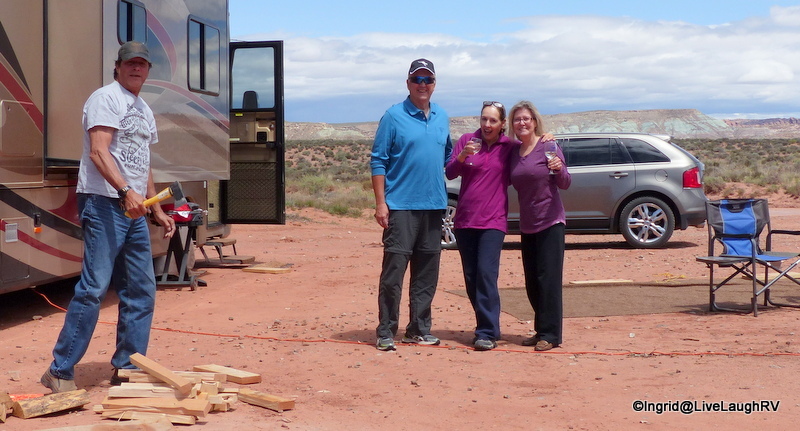 We love Moab too…maybe we will see you and Al here next spring. And I agree…Utah rocks! Wow… that’s a lot of people. I wonder if they use one entrance line to space the people out. I definitely want to plan more time in Moab and Utah in general next spring and would love to meet. Right now we’re in Dillon, CO and it’s brrrrr…. cold. 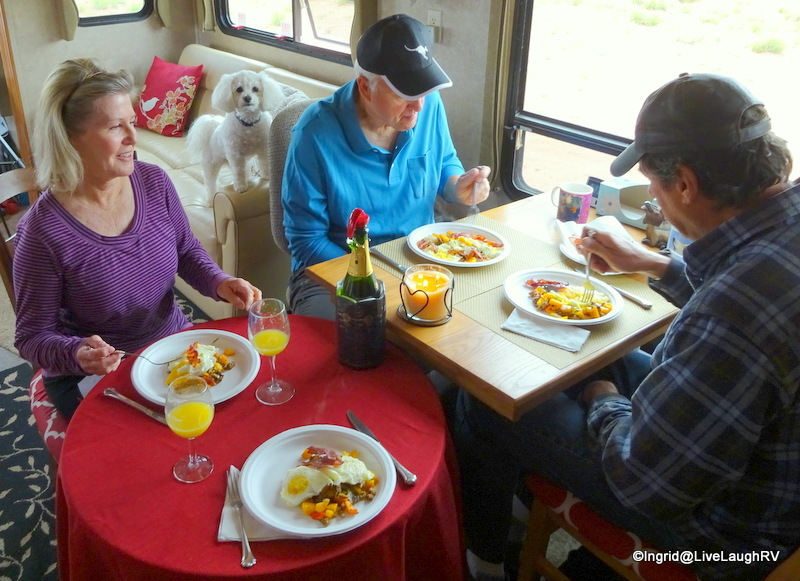 Love the little side table to extend your dining table in the RV! Thanks. By adding that table it gave us all a lot more room. Haven’t had a chance to check your food blog yet..but that Spankatini sounds fabulous!! It’s delicious and I usually make it for lunch when it’s just Al and me. Very filling. Ingrid, great post about Utah’s beauty and your good friends. Yeah, we’re envious of their solar too. Ours is much more modest, just two panels. Gets us by and really glad to have it but maybe some day, when we grow up, we can have a REAL system? Thanks for your pictures! Great idea. Probably much better in the Spring than in mid July when we last visited. We found ourselves in Farmington NM, which was pretty nice still because of altitude, and wanted to get up to Olympia WA. 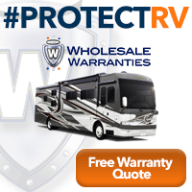 There’s no good way to get your RV from NM to Seattle area in the middle of the summer, just too hot. Still, we agree — Utah in the Spring or Fall. 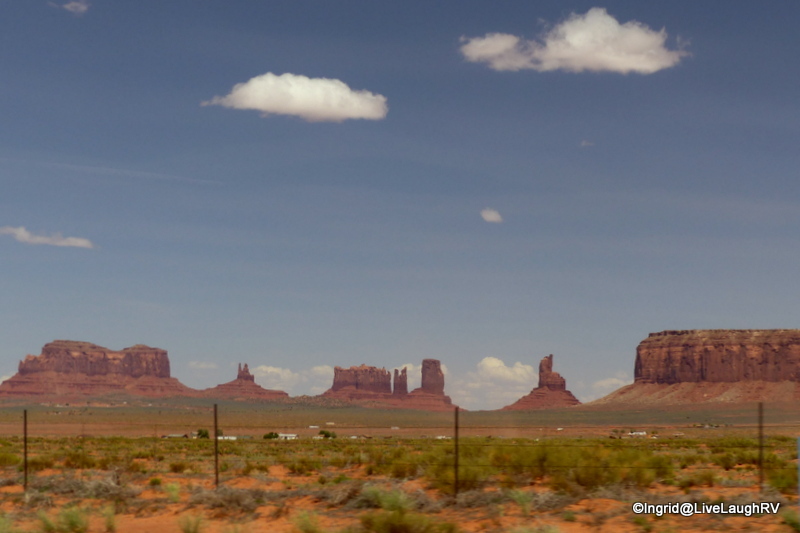 A road trip through Utah is definitely in my future – – such classic sights from the road! Being greeted with margarita in hand sounds perfect :-). The long driving day was certainly worth it to be with friends in such a beautiful spot. And bacon, sausage, and ribs on Mother’s Day sound like a perfect way to celebrate! What a delicious sounding brunch! Good friends are a treasure. If we couldn’t be with our children, then being with great friends was the next best thing and enjoying good food and drink. Thank you Teri. You wouldn’t be able to put your camera down in this incredible state. The spank-a-tini sounds very good. Love the rainbow shot. It’s one of our favorites…. and very filling. Well, I’ll be good… I’ll wait to hear about the “dirt” you got. I have some thoughts pending in my brain as I type away to you!! Fun times! Went by too quickly. Mike is craving another spankatini! And I just bought to more butternut squash 🙂 Next year, I plan on doing much better in my scheduling and give Utah the proper time it deserves. I love Utah and the Blue Pig has some awesome food! What a gorgeous spot–I have travel envy! So glad you were able to get power from your friends! Yikes. Looks like a beautiful place there, for sure. Spankitini! 😀 Sounds like another winner on the food front. It was a winning weekend all around and although we had our fair share of rain, my heart goes out to Texas. Utah, Alaska and Hawaii the only states I haven’t been to yet. Gotta get to Utah! Those pics looked so great! Wow, that is quite the impressive list of states visited. With only 3 left, you shouldn’t have any trouble seeing those this year 😉 At least Utah…. a lot easier to get to than Hawaii and Alaska! How nice that your friends came to the rescue! I’d have to pass on all the pork, but I love Milt’s burgers. If you have a chance, could you e-mail me privately the GPS coordinates where you parked? I’m going through about three weeks or so on my way to Oregon and it looks like a great spot. I’m glad I’ve already visited Arches (more than once) – I hate lines. 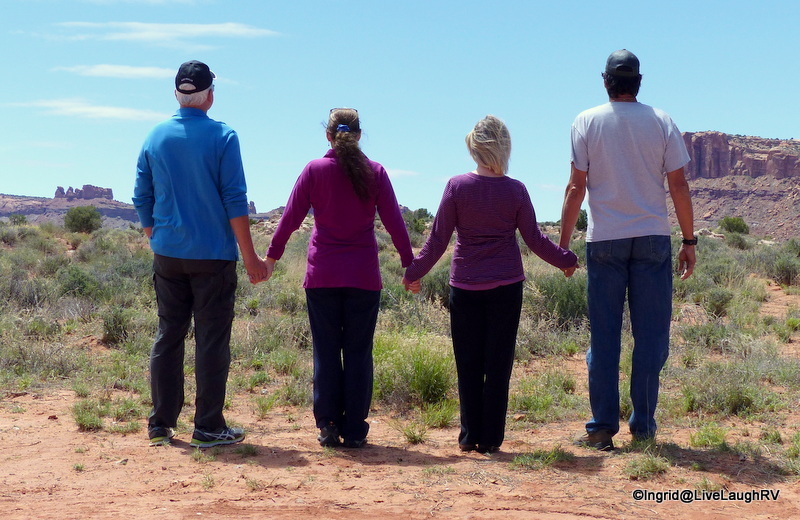 Whenever we have visited Arches, we get off to an early start and it’s always amazing how many people have the same idea. I’ll email you shortly. 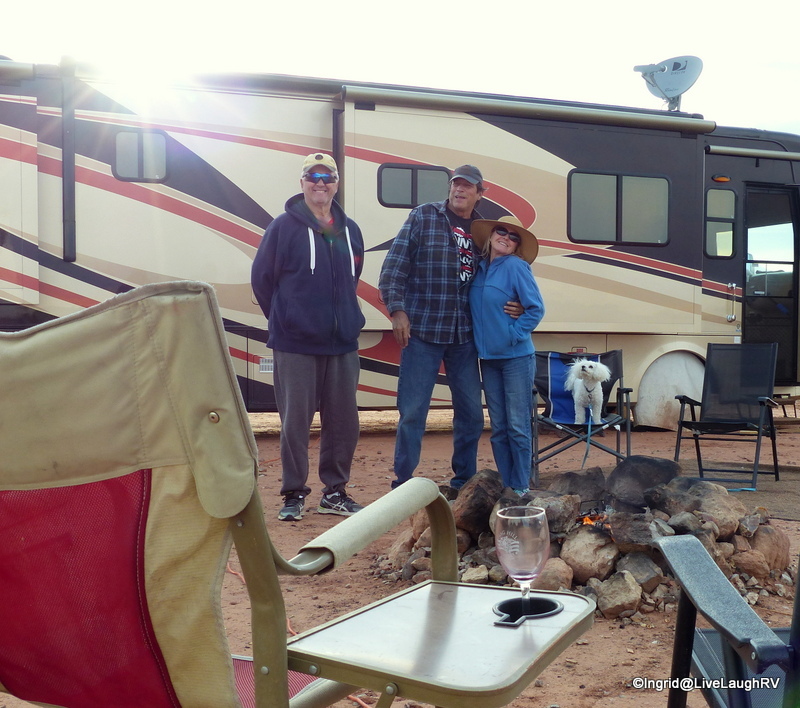 Full time RVing is something I have thought of doing. The trick of course is to have work that allows that, since I am unable to retire/too young/starting working later in life, ect. It really sounds like fun! I have thought about working as a travel nurse when my children are grown. I know of a family who does that. I couldn’t right now due to a shared custody agreement. Once my children are older, they could come with me on my travels if they wanted. That red dirt or some good gossip? I need distracting. Tell me now! Me tooooo! My mind is crazy thinking of lots of scenarios!!!!!!!!!! 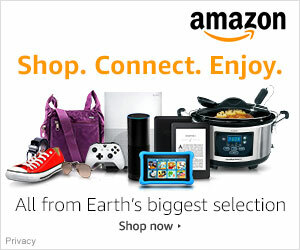 It sounds like you are having a lot of fun! 🙂 I’m thankful you had good friends near you at the right time. Yes we had a great time and it was wonderful having friends come to the rescue. Looks like yo landed in a pretty spot. I haven’t been to Moab in years. That was a long day of driving for you guys, we try our best to avoid that too. Exactly why we did not hike up to Delicate Arch… it was soooooo busy! But… it’s still so beautiful. Wow. That probably has a lot to do with the holiday though. 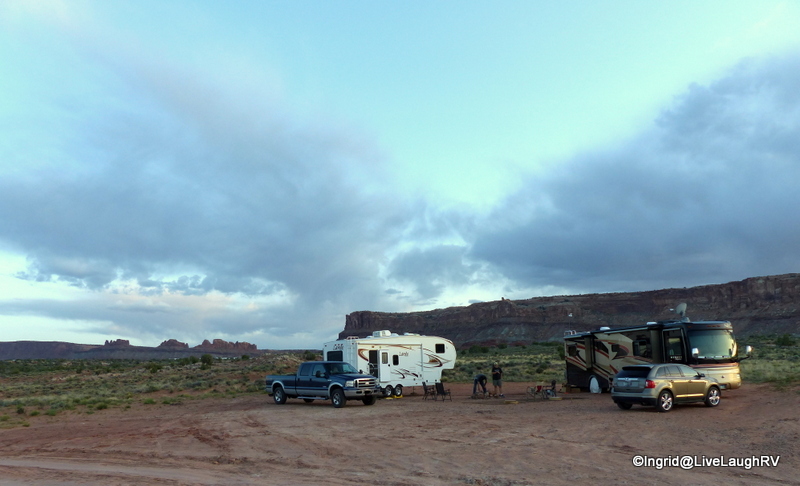 We stayed at the arch view campground a time or two when my kids were young. It was not in town and always nice.